A beloved Lake Merritt play sculpture is a reminder that creativity is a public good. Guiding the transition of San Francisco’s Presidio from military base to national park may be the standout accomplishment of the landscape architect and parks administrator William Penn Mott Jr., who assumed the helm of the U.S. National Park Service in 1985, but it’s a little “monster” from early in Mott’s career that has received renewed attention. The new Nature Gardens at the Natural History Museum of Los Angeles County by Mia Lehrer + Associates provides habitat for the city’s surprisingly diverse wildlife and brings the museum’s research outside; Gweneth Leigh, ASLA, compares the dull and outdated playgrounds of the past to two challenging, yet exciting, Australian playgrounds by Taylor Cullity Lethlean and James Mather Delaney Design; and Lauren Mandel, Associate ASLA, looks at how research at the Chicago Botanic Garden roof gardens by Oehme, van Sweden Landscape Architecture are designed to provide hard data on suitable plants and soil depths. 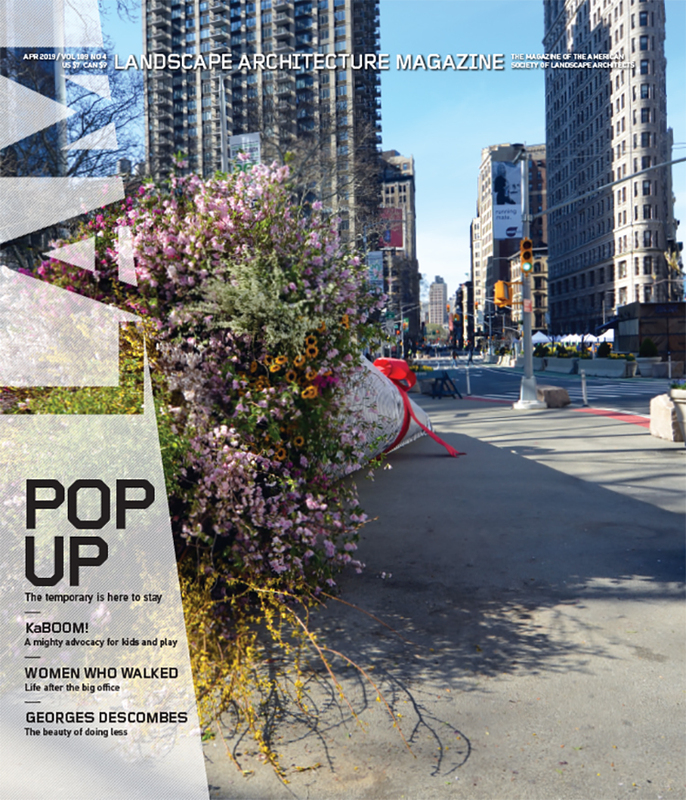 In our departments, Now highlights Louisiana’s wildlife management areas, Dirk Sijmons’s studies of energy and landscape, and a new program that puts chief resilience officers in cities; Water takes a look at the Miami Conservancy District in Ohio; Practice features an unusual partnership between a salt merchant and the firm Landing Studio; and in The Back Jonathan Lerner wonders if MOMA’s exhibit, Urban Growth: Tactical Urbanisms for Expanding Megacities, is as tactically urban as it aims to be. All this plus our regular Species, Goods, and Books columns. The full table of contents for January can be found here. Keep an eye out here on the blog, on the LAM Facebook page, and on our Twitter feed (@landarchmag), as we’ll be ungating January articles as the month rolls out. Credits: “So Cal,” Luke Gibson Photography, Courtesy Mia Lehrer + Associates; “No, No, You Go First,” Brett Boardman; “This Is a Test,” Robin Carlson/Courtesy Oehme, Van Sweden; “A Plan to Plan?” Louisiana Department of Wildlife and Fisheries/The Conservation Fund; “Dry on a Good Day,” Courtesy Miami Conservancy District; “Strange Companions,” Courtesy Landing Studio; “Growing Pains,” Courtesy NLÉ and Zoohaus/Inteligencias Colectivas.